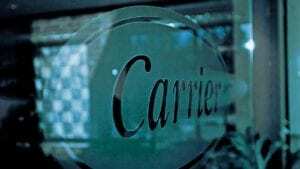 Carrier announced the commercial availability of its AquaEdge® 19DV in North America. The centrifugal chiller features breakthrough technologies, Greenspeed® intelligence and a low global warming potential (GWP) refrigerant R1233zd(E), which has a GWP of ~1. The AquaEdge 19DV, with installations worldwide, delivers on customer demands for ultimate performance, leading efficiency and environmental responsibility. Updated innovation in every aspect of chiller design including compression, heat exchange and controls technology enables Carrier to improve cooling efficiency substantially while allowing for effective heat recovery and free cooling all in the same machine. EquiDriveTM two-stage back-to-back compressor load cancellation technology for bearings last the life of the chiller. Greenspeed® intelligence Variable Frequency Drive (VFD) design to protect against dirty power and dirty environments. MaxFlex capability for operation in demanding conditions such as variable flow, heat recovery, free cooling, series plants, dual temperature systems, and more. Refrigerant R-1233zd(E), an environmentally sustainable refrigerant with an ultra-low GWP of ~1 and an A1-rated safety classification per ASHRAE standard 34. Variable orifice for robust refrigerant metering and proper refrigerant levels during variable lift and load conditions. SmartViewTM intelligent controls and integration with the Carrier lifecycle data management system for easy tracking and analyzation of operational data helps identify potential risks or areas for upgrading. The control system can also be linked to the user’s building automation system, enabling remote access to the chiller’s running data in real time. Intuitive touch screen user interface that provides graphical trending and remote access capability and can be mounted on any corner of the machine. The 19DV also features Carrier® SMART Service, and includes a number of connectivity solutions such as: remote diagnostics, long-term performance trending, benchmarking, decision analytics, and advanced notifications. By leveraging insights derived from these capabilities, Carrier SMART Service can help improve equipment reliability and reduce energy usage, maintenance expenses and resource consumption. The AquaEdge 19DV is now available for immediate sale in 500 to 800 ton capacity. Additional capacity units are forthcoming.